The incredibly skilled, silky sound of Kevin Burke’s fiddling has graced two supergroups, The Bothy Band and Patrick Street. But fiddle aficionados prize his solo albums as golden opportunities to hear him front and center throughout. 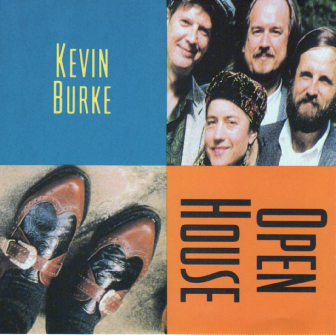 Open House brilliantly explores Kevin’s strong Irish traditional influences while also tapping into his extraordinary store of American and world music, perfectly suited to his style. Paul Kotapish provides expert backing on cittern and Mark Graham is unsurpassed on harmonica. The American/Celtic tune medley, “The Bus Stop Reel/Miss McCloud’s Reel/Lost Indian,” features the fantastic foot percussion of Sandy Silva, who has danced in concert with Altan. A decidedly continental flavor surfaces in “Frailach” and “Bourrées,” while the spice of swing music emerges in Mark Graham’s clarinet flourishes on “Barn Dances.” Produced by fellow Bothy Band alumnus Mícheál O’Domhnaill, Open House is another milestone in the career of an Irish fiddler many regard as the best alive.